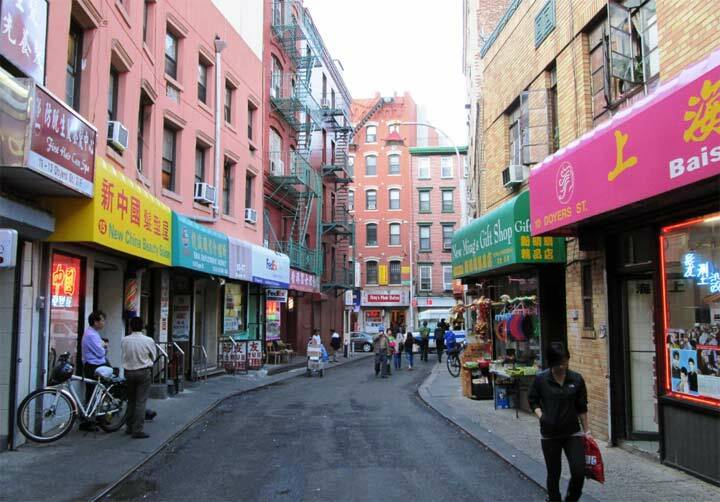 Fabulous 57th Street, just south of Central Park, is relatively unplumbed territory for me, though I have been fascinated in the past with the block between Broadway and 7th Avenue. As a matter of fact I’m rather more familiar with stretches of 57th Street in Maspeth, Queens than I was with its more familiar namesake. But, having read that Rizzoli is likely on the way out from its pleasant alcove on 57th, I resolved to walk along the stretch from 1st Avenue west to 8th Avenue and see what there is of interest. 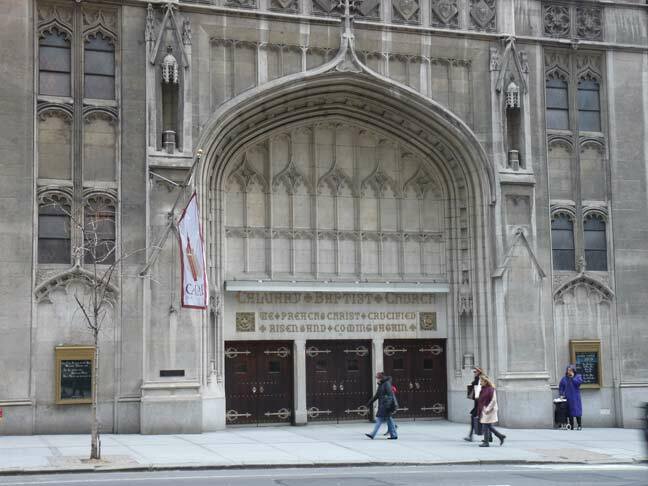 What I found between 6th and 7th Avenues, at 123 West 57th, was a church occupying the bottom floors of a hotel. The unaffiliated Calvary Baptist Church was established in 1847 and has been in this location since 1883, when it was seated in a red sandstone church designed by John Rochester Thomas. Since 1931, the church’s home has been in this 16-story stone skyscraper, where it is accompanied by the Salisbury Hotel. I was unaware that the ‘skyscraper church’ is a genre, but this building has noteworthy predecessors, such as the Chicago Temple Building and the William Taylor Hotel and Temple Methodist Episcopal Church in San Francisco. 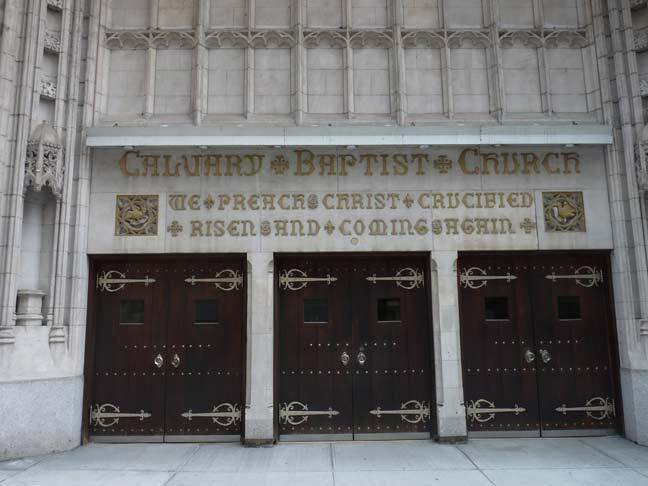 Nevertheless you learn something new every day, and I was surprised to find ecclesiastic-style lettering on the ground floor of “just another” tall building on 57th. Presidents Richard Nixon and Bill Clinton have visited the church, as well as famed preachers Billy Graham and Billy Sunday. Concert pianist Van Cliburn attended services here and donated two Steinway pianos. The current [January 2014] pastor, David Paul Epstein, is the brother of TV personality Kathie Lee Gifford. Is this a repost from a year ago, a page that was going to be posted a year ago but wasn’t, or did you say January 2013 when you meant 2014? Fixed. I live in the past. My father owned a store, “Gourmet and Gift Center” at 153 w 57 St. from 1964 to 1983. We had many celebrity customers (including Van Cliburn and Barbara Walters who lived in the neighboorhood. Sorry to hear baout Rizzolis. I knew every business on that block including Bookmasters, the somewhat grungy bookstore on the corner of 7th Avenue. And thus bring us much riches. The tag line at the bottom still says “1/24/13”. Remember the Ritz Thrift Shop on W. 57th? I remember commercials for it. They dealt with furs. Not what you expect to find in a “thrift shop”. Loved those cheesy Ritz Thift Shop TV commercials! Investigation into the Steven Arcieri case has escalated. The female known as Mary Catherine Sorenson, Mary Rose Sorenson, now believed to be related to John here in Sacramento. Jim, Arcieri’s cousin may be involved with the death of his mother in the Men’s Restroom of the Church. The father was killed in Mississippi, Officer Sebastian Mueller’s mother, blonde found him and the records, also murdered. Kit Fung had Arcieri’s cousin’s records from North Carolina, Kiss the Girls victims in a swamp, media. The little boy drowned in the early 1980s in a YMCA pool in Lower Manhattan, black trunks, Ed Bradley report. Vicki Logan had records, BBD&O from Kit. Ellen Chin attacked her verbally, Mary Pat, choir, called Vicki from New Jersey to sing. Same incident occurred with Mary Catherine. Mary Pat poisoned her from Dr. Lin, NJ. His brother works in Portland, OR, Curry County Sheriff’s with Officer Gardner connected to Jim. All victims were poisoned. Mary Pat is a suspect under Three Strikes. Jim Bond is missing, possibly in Chicago at church where Poppy Badger was killed, poisoned. Why go there alone with an Asian family? 18th Precinct and Carl Schwartz, Herrick Feinstein involved with calls to Jim. Mark, Smog Diagnostics was hit in the early 1980s in Folsom. Carl Schwartz was the Paralegal in the newspaper. Mark was killed recently in a hit and run on Florin Rd. Lightrail Attendant’s witnesses. Pastor Epstein and Judge Hastings, Santa Clara Superior Court involved with Mary Catherine and Kit Fung’s death. 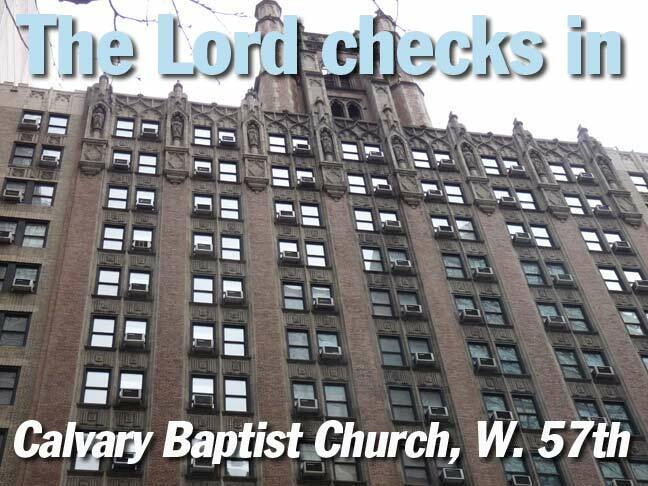 Comment from Sharron Robertson, December 2, 2015 should be erased re Steven Arcieri to Calvary Baptist Church, 123 West 57th Street. Thank you for responding. 18th Precinct will respond. Do not use e-mail. I managed The Calvary Baptist Church Bookstore for ten years. I am currently going into the ministry after retiring as a civilian for 20 years on the Nassau County Police force. The Bookstore was a great ministry and my staff and myself saw many great things happen there. I was baptized there and taught Sunday School. Did I miss mention of the radio station that used to broadcast from there or is it still in existence? As someone who was baptized there and was a member and Sunday School teacher did I miss mention of the radio station that was there or is it still in existence?